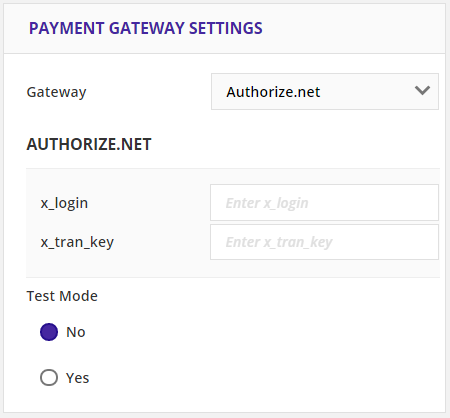 The Authorize.net Payment Gateway provides fast, reliable and secure transmission of transaction data between websites and the payment networks. Authorize.net works with almost all merchant account providers, and ONTRAPORT can process all types of orders through Authorize.net (single orders, subscriptions, payment plans and trial periods) without any additional features required. Authorize.net can also process transactions in non-US currencies. Log into the Merchant Interface at https://account.authorize.net/. Click the Home tab near the top of your screen. Note: The API Login ID is sensitive account information and should only be shared on a need-to-know basis, for example with your Web developer for the purposes of integration with the payment gateway. ONTRAPORT allows you to verify the first use of the card using the three or four digit CVV or CVC code on the card. 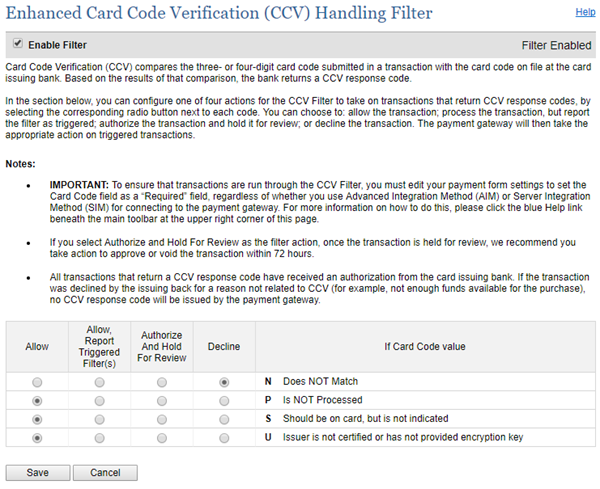 However, because PCI regulations prohibit storing this value you must edit the Enhanced Card Code Verification (CCV) Handling Filter settings in Authorize.net. Unless you complete this step you cannot use payment plans, subscriptions, upsell offers or free trial periods in ONTRAPORT. You can use the Address Verification Service, but we don't recommend it. The chance of transactions failing with AVS turned on is much higher. Return to the Home > Settings menu and click the Card Code Verification link. Click the Enable Filter checkbox if you wish to have the CCV code verified on the initial purchase when the customer first enters their credit card number. You can also choose to uncheck this box and click Save at the bottom. If checked, continue with the steps below. In the table at the bottom select the radio button under "Decline" for Card Code Value "N", "Does NOT Match". This allows ONTRAPORT to check the CCV number entered by your customer on an order form. Click the radio buttons under "Allow" for the next three items. These allow subsequent payments to be made without your customer re-entering their card information. Recommended: Return to the Home > Settings menu and click the Address Verification Service link. Recommended: Uncheck the Enable Filter checkbox at the top. ONTRAPORT does send the billing address with each transaction, but a higher false rejection rate is experienced when this feature is enabled. We recommend you leave this unchecked. These settings will allow ONTRAPORT to initially check the card CVV code input by your customer but allow subsequent charges for a payment plan or subscription without the customer having to fill in another order form. Log into the Merchant Interface at https://account.authorize.net/ and click the Home tab near the top of your screen. x_tran_key: Enter your Transaction Key that you copied from Authorize.net. ONTRAPORT is set to US Dollars (USD) by default and displays the $ sign. 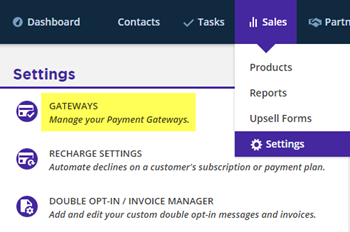 To enable your order forms, invoices, and sales reports to display another currency symbol, or to add the currency code (USD, AUD, EUR, etc.) to appear before or after the amount follow these instructions. 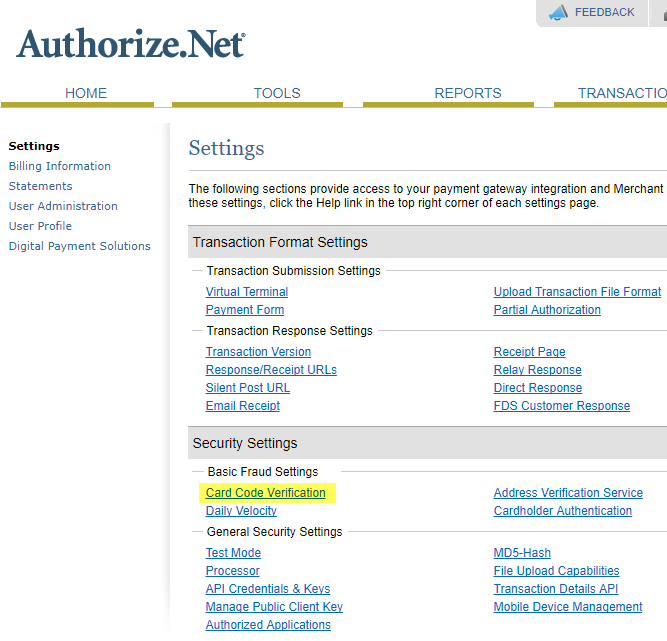 Note that Authorize.net is not affected by the setting in ONTRAPORT. 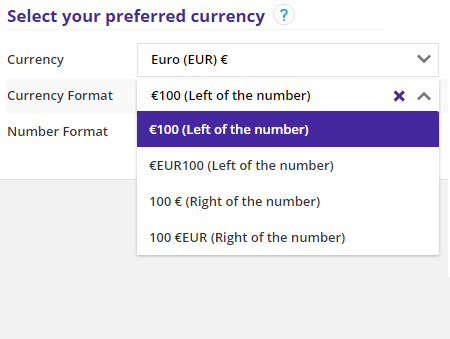 If you want to bill in a different currency you must configure that currency in Authorize.net first, and then change the setting in ONTRAPORT. See all countries Authorize.net supports. 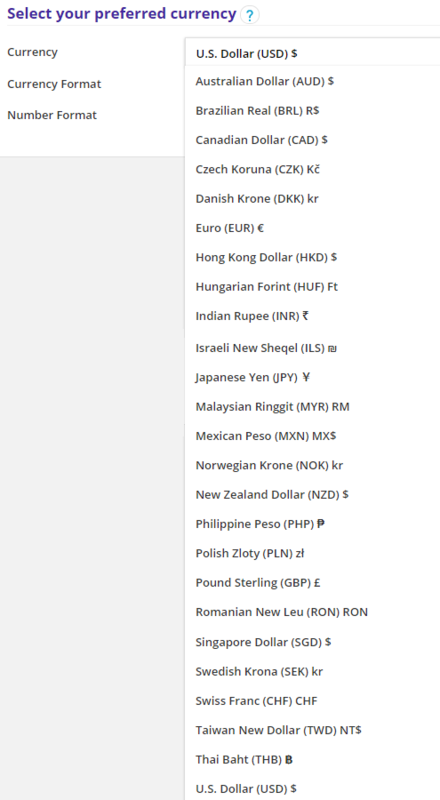 See all countries PayPal Pro supports. See all countries Stripe supports. A. Our system allows one currency only. We recommend you use separate ONTRAPORT accounts for each currency. The only alternative is to use UltraCart, a native integration with ONTRAPORT that does support multi-currency handling, with up to 12 different currencies accepted. A. Your payment gateway should have been set to bill in the same currency, or have a bank account attached that processes in that currency. Your payment gateway received the payment in the funds you specified and supplied that currency to your bank. The responsibility for the currency conversion charges are between you, your payment gateway and your bank. ONTRAPORT will not reimburse you. Q. Suddenly my Authorize.Net gateway integration isn't working. What's up? Q. Can I use the same Transaction Key in ONTRAPORT I use in other applications? A. You can. This article from Authorize.Net has more details! Q. Can I use Authorize.net with currencies other than US Dollars? A. 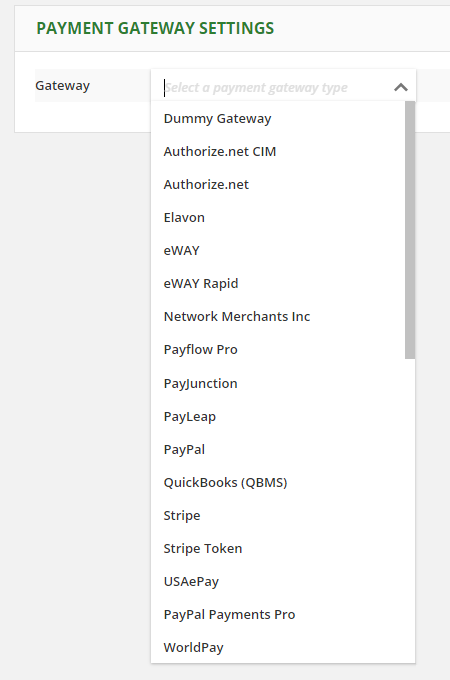 Yes, Authorize.net supports many different currencies. We recommend you set your ONTRAPORT account to the currency you set in Authorize.net to take advantage of the correct currency symbol on Order Forms, in sales reports, etc. 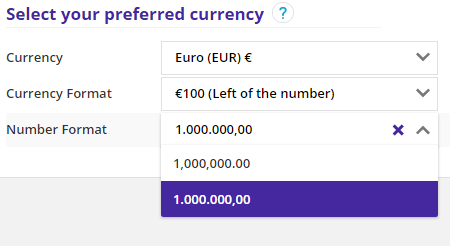 You can set the currency type in Administration > Localization as explained in the Currency Options section. Q. I changed my currency to Pounds Sterling (GBP) but all the sales values are the same in my account even though they show the pound symbol now! The values should be converted! What about ERROR Handling? What happens on CC decline and other errors? We need a way to handle these errors. Please provide support or document links on how to set up error handling.